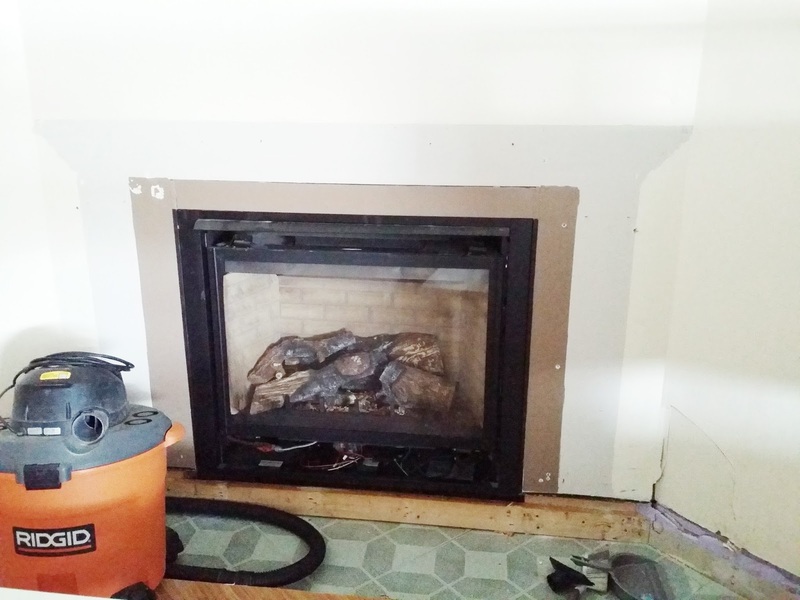 Fireplace progress + a whole new project! We are extremely settled in our home (almost 16 months!) but we may just give all of our 3 kids, their own bedrooms. Their own little spaces to unwind, hide-away, and become responsible for their own little piece of the world. It's been nice having Brooklyn & Ava share a room, but Brook is far mature for her age. She's complaining Ava is messy and very noisy. Of course, all 3 girls have sleepovers on an almost weekly basis in the basement so I have a feeling this is almost pointless, almost. So, we came back to our original "idea" of sectioning off 1/3 of the basement as a bedroom for Charlize. Not very big, but bigger than what she currently has. And since she uses the downstairs bathroom for everything, it just makes even more sense. We then can send certain toys to the girls bedrooms and really use our new family room as a movie/TV watching, game playing room. Oh, and I'm also incorporating 2 office workstations along one wall. That's a tall order I know in a room that is only 14' x 12'-7"! 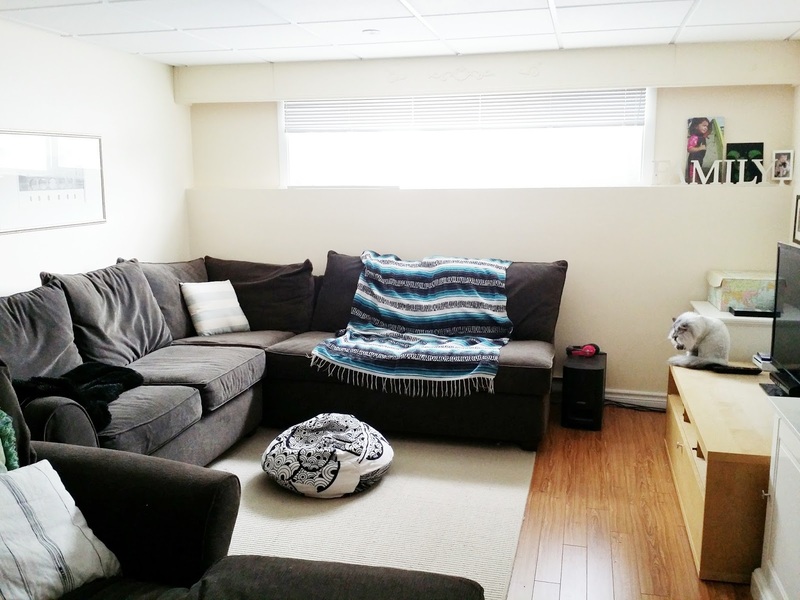 And our sectional couch is 8'-4" along one wall and 8'-4" along another wall. It's huge and comfy and hides every spill, dirt and even cat claw marks!!! It's a keeper, forever. My quickly, drawn floor plan (almost to scale). 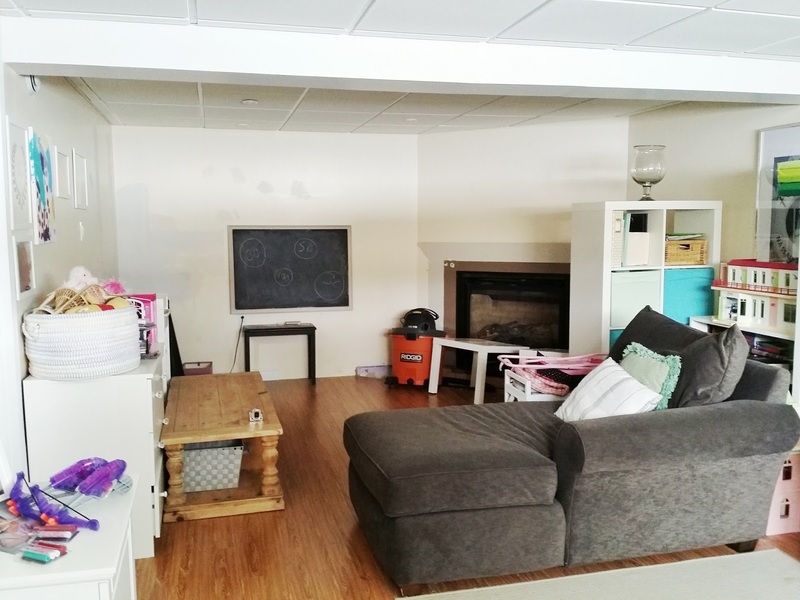 Before we put up a wall dividing the 2 rooms I want to arrange the living room furniture as it will be to make absolute sure that this makes sense for us as a family. So far, the home lives really well and I just want to make sure we don't start feeling cramped in here just to give Brooklyn her own room. The girls play in the basement a lot and I don't want to give that up if it doesn't make sense. It's always important to make up scenarios in your head when designing rooms to see if something will or won't work. Like sleepovers, parties, etc, etc. This would become Charlize's bedroom. It's got a lovely huge window and a ledge all along that wall that she can place all her books on. This is the view right as you walk in. Obviously the basement doesn't look exactly like this. Some things were moved around so Greg could work on the fireplace properly. But just to give you an idea. Where our new family room would be. 2. 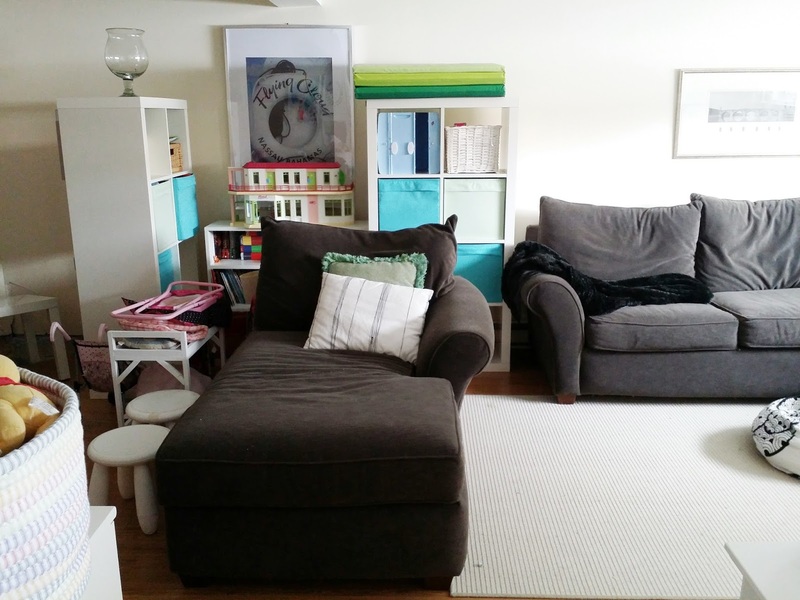 Clean, organize and move the couches and units to their new location. See how that goes. Same day when fireplace (or at least fireplace floor) is completed. Or day after, LOL. 3. If that works then we need to move the light switches on the wall, remove a radiator, switch over some pot lights to a new location, and fish the cable wire to it's new location. A couple days I'm guessing. Maybe a week. 4. Put up a new wall. How the heck do you do that with a suspended ceiling in the way??? Fun times Greg, I'm sure you'll figure it out! Add a pocket door (a whole other process to structure in the new wall, but one I know Greg will be able to do!) 2 weekends (and some evenings)? 5. Patch all walls and paint! Now there are a couple concerns I have. 1. See the bulkhead on my floorplan (it's a blue set of dotted lines)? Will having that and a wall 3 feet away look ridiculous? Hmmm. It would make more sense to install a wall at that bulkhead. But then Charlize gets a fireplace and no window. I want her to have the other side for sure. We will have to further investigate but I think this is the best configuration anyway. 2. I'm losing the chaise longue section of the couch. So 1 seat less. Oh well. It was rare in all the places it's been that it was together anyway. Other than that, I think we're good. Charlize is older now so she hangs out with us at night. Sometimes she'll watch a show, or study in her room, which she can now do both close to us. Brooklyn will stay in the room she currently has (although of course she wants to switch rooms because it's different). And Ava will get Charlize's old room. We will have to get another single bed for Ava. There's a particular bed from Ikea I've always wanted for my little girl. We'll see. The bunks will stay in Brooklyn's room for now until she's bigger anyway. It's perfect for sleepovers and for hanging out; and she has the choice, top or bottom bunk! Excited to see how the living room comes together! 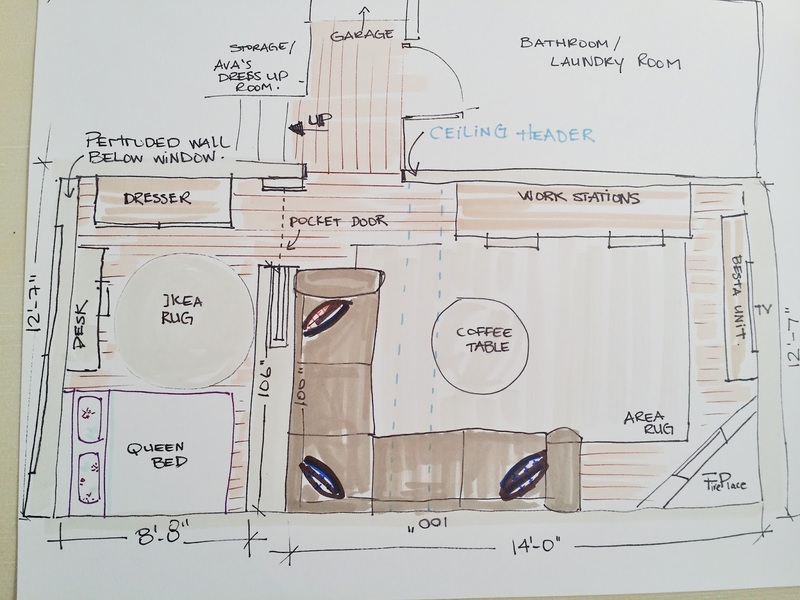 I will find out shortly if this bedroom project is a go! At least I know the basement will look fresh when it's painted (BM simply white) and the fireplace is done! Can't wait!